The counties comprised by this intervention area are: Almodôvar, Serpa, Beja (southeast), Mértola (Baixo-Alentejo subregion, Beja district), Loulé, Castro Marim and Alcoutim (Algarve region, Faro district). The civil parishes included are: Almodôvar, Santa Cruz, Senhora da Graça de Padrões (Almodôvar county), São Pedro de Solis, São Sebastião dos Carros, Espírito Santo, São Miguel do Pinheiro, São João dos Caldeireiros, Corte do Pinto, Santana de Cambas, Alcaria Ruiva, Mértola (Mértola county), Cabeça Gorda, Salvada, Quintos (Beja county), Santa Maria, Salvador (Serpa county), Azinhal, Odeleite (Castro Marim county), Martim Longo, Giões, Pereiro, Alcoutim (Alcoutim county) and Ameixial (Loulé county). The Natural Park of Guadiana Valley, with an area of 69,773ha, was classified in 1995 as protected area, aiming the preservation of its faunistic, floristic, geomorphologic, landscape and historical-cultural values and the promotion of the sustainable development of the region, as a response to the threat of the progressive disappearance of the traditional systems of land use. This is a diverse area considering its landscape, with plains of extensive dryland crops, scrublands (dominated by Cistus sp), holm oak woodlands (montados), Mediterranean shrublands, quartzite elevations and majestic embedded valleys alongside the Guadiana River and its tributaries. 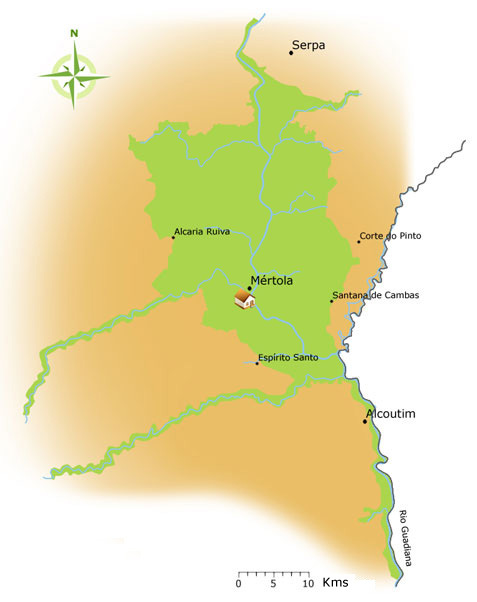 This protected area comprises the counties of Mértola and Serpa in a section of the river that extends from Pulo do Lobo (upstream) until the mouth of Vascão riverside, border between Alentejo and Algarve, where Serra do Caldeirão is risen, overlapping almost completely the Guadiana Valley SPA and partially the Guadiana pSCI.